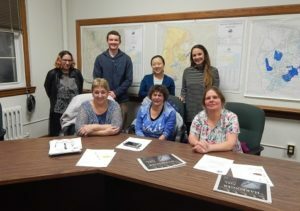 Northborough – The Northborough Youth Commission held its monthly meeting Feb 15. Appointed by the Board of Selectmen to advocate for and support Northborough Family & Youth Services, the Youth Commission includes two student liaisons: Sivan Nachum from Algonquin Regional High School (ARHS) and Brian Schwalm from St. John’s High School in Shrewsbury. “This board is near and dear to my heart. It does amazing things with very little resources. It’s a privilege that our town has this. 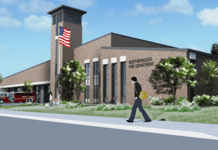 Not a whole lot of people know about what we do in terms of working in the schools and working with kids,” explained Commission Chair and longtime member Becca Haberman, who is also a guidance counselor at ARHS. “This board serves a very important purpose. It’s a sounding board because its people from the schools and from the community and the youth. They’ve been very helpful,” added June David-Fors, who has been the agency’s director since 2006. Her staff is small with one intern, one counselor, and an office assistant. However, 926 residents were assisted in 2017. A variety of clinical services are offered, including school outreach, on-site counseling and crisis intervention which served 167 residents in 2017. One hundred forty-eight residents received resource referrals, fuel assistance and assistance with SNAP Food Program applications, 179 benefitted from partnership programs, and 432 received information and referral services. David-Fors reported that she presented a workshop at the recent Massachusetts Municipal Association conference held in Boston. Her topic centered on the agency being a department within town government. Only about 60 of the 351 communities in the commonwealth have this type of resource. As such, the agency is at an advantage because they are in close proximity to and work collaboratively with other departments. Additionally, they rely on collaborative community partnerships with other town entities to share resources. Through an effort with the MetroWest Substance Abuse Prevention Coalition, Northborough, Hudson, Ashland, Framingham, Natick and Southborough have been identified as having high levels of substance abuse. A primary goal is to educate residents about this problem. The agency recently presented “Hidden in Plain Sight” at Northborough’s Robert E. Melican Middle School. This program illustrated ways that children might be hiding substances from their parents. It also provided information about how parents can talk to their kids. The student liaisons then shared how vaping has become a problem in schools, particularly its use in school restrooms. The way that it is marketed to kids is part of the problem. Looking ahead to FY2019, the agency expects to be level-funded. “Maintaining the current service level in the budget and trying to advocate for more services, staying involved with the committees we are involved with and continue providing the services that we provide, are our primary goals,” David-Fors stated. For more information about Northborough Family & Youth Services, visit www.town.northborough.ma.us/Pages/NorthboroughMA_Family.